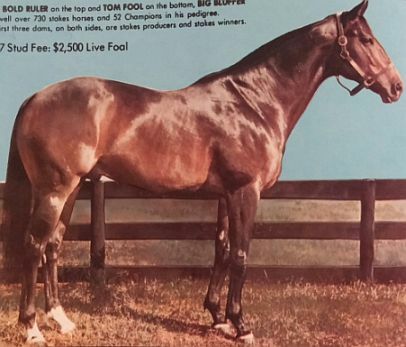 Big Bluffer was a Thoroughbred by Bold Ruler out of Fool's Play. He won the Select Stakes and Hurricane Stakes and stood at stud at Gross Point Stud Farm in Florida. While standing at stud in Florida he sired Misty's Twilight out of Sunshine. Big Bluffer was mentioned in his daughter's book Misty's Twilight by Marguerite Henry. In the book it was said that he was picked to sire Sunshine's foal because he was a son of the great Bold Ruler.